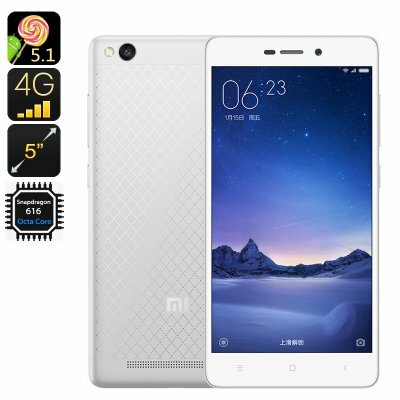 Successfully Added Xiaomi Redmi 3 Android Smartphone - Android OS, Dual SIM 4G, Octa Core CPU, 13MP Camera, 4100mAh Battery, 2GB RAM to your Shopping Cart. Optimization comes in many ways and often brings along breathtaking surprises. With the launch of the Xiaomi Redmi 3 this Chinese smartphone manufacturer has introduced us to yet again to another top quality product. Ultra-thin yet packing some real power - the Xiaomi Redmi 3 is a truly impressive android smartphone. Powered by a high-performance 1.5GHz Octa-Core Qualcomm Snapdragon 6161 processor this android smartphone is capable of handling the most demanding of tasks as if it’s nothing. Browse the web, watch FHD movies, and play the most demanding mobile games – the Xiaomi Redmi 3 is a true multitasking device that can handle it all without dropping a frame. With Google Play installed on the device you now have access to millions of free Apps, games, movies, and more, providing you with years worth of entertainment. Along with its powerful CPU comes 2GB of RAM and the Adreno 405 GPU. With its 16GB of internal storage and additional 128GB external storage, this android smartphone offers you enough space to save all your games, movies, apps, and more which, thanks to its remarkable hardware, can be enjoyed to their fullest in stunning HD quality. The 5 inch HD display of the Xiaomi Redmi 3 further enhances your user experience by providing vivid colors, truly bringing your photos and video’s to life. Equipped with a massive 4100mAh battery this Chinese smartphone offers a day’s worth of continuous usage time to ensure that you can get through the most demanding of days without the need to recharge. Play your favorite games and watch the latest movies for hours in a row and browse the web limitlessly, with the Xiaomi Redmi 3 there is no need to worry about running out of juice anytime soon. Holding a 13MP rear camera this Chinese smartphone offers you all the means needed to snap professional-quality pictures. Its secondarily 5MP front camera is a perfect little snapper fit for all selfie lovers out there. From now on not a single moment in life will be left un-captured. The Xiaomi Redmi 3 comes with a 12 months warranty, brought to you by the leader in Android devices as well as wholesale electronic gadgets..